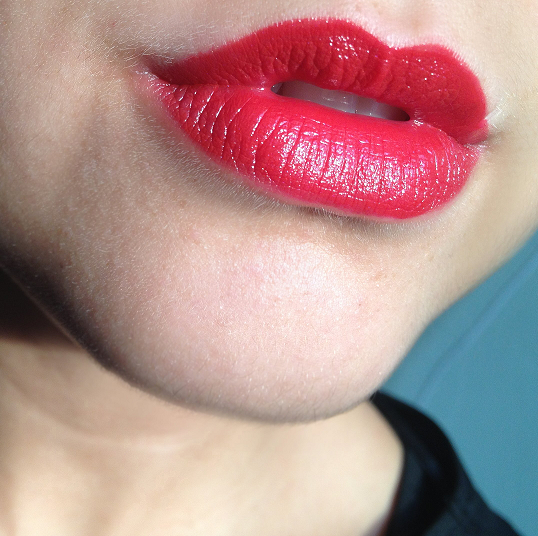 After ages of looking for the perfect red lipstick, I finally found one! 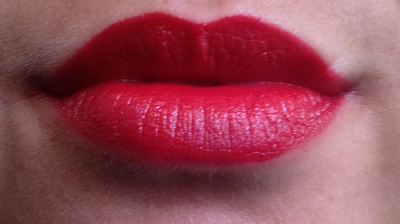 It's been a long journey, and I'm glad I found the right lippy for me: Shiseido Perfect Rouge, colour RD 415. When I'm buying a new makeup product, I like to take my time and really enjoy the journey. Especially with a beautiful lipstick. I try it on, view the colour on my lips and with my skin and leave it on for a while to see how long it lasts. The lady from Shiseido has helped me perfectly. I'm really satisfied about the quality of the service. The lady gave me good advice about the colour and she told me something about Shiseido. You could really tell she was enthusiastic about the brand and I like to see that in a salesperson. I mean, she ís selling the product. If she's not enthusiastic, why should I be? The colour she recommended was the same colour the model's wearing in the advertisement. This is the lipstick in normal daylight. It's a red colour with a slightly blue undertone. These colours match my skin best. Plus they make your teeth whiter! A swatch of the lipstick. Without anything on my lips. And again. I love the colour! On the pictures I'm only wearing the lipstick, no lip pencil or whatsoever. A picture in normal daylight. As you can see, the colour is quite intense. I'm more than happy with this new purchase! The colour is beautiful. It matches my skintone and it makes my teeth whiter. I love to wear bright lipsticks and red is definitely my favourite. So I don't mind investing in a good lipstick. 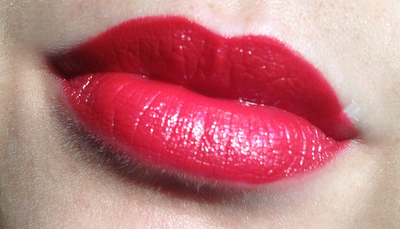 About the lipstick: it's very pigmented, but you get the best result if you build it up. My lips are quite pigmented so I'm used to building up lipstick. The staying power is not amazing. It lasted for about 3 hours. And I have to say that I didn't use any lip pencil and/or concealer. When I use a lip pencil, it stayed for about 4/5 hours, but I did talk a lot (I was working when I tried it with a lip pencil). Also, it depends per person how long a lipstick lasts, because on my lips they don't last very long. The price is €25,55. If you don't want to invest in the lipstick, it's expensive. I couldn't think of any more cons! I would definitely re-purchase this lipstick. I mentioned the staying power before, but I don't think this is a con, since red lipstick usually doesn't last long and especially on my lips. I think it would be unfair to mention this. What are your experiences with Shiseido? And have you found the perfect red lippy yet? Lovely blog! Visit mine pleasestrikeapose.blogspot.com/2012/07/foulard-dress.html and if you like it follow me! Beautiful colour! Like your blog, what about following each other with GFC & Bloglovin? That color suits you well...I'm not sure if I could pull it off! I found you on Blog Hop on Bloggers Unite. I really need u to buy a red lipstick, thanks for the suggestion! Following u now.... Hope u'll follow me back! This looks amazing on u! I hope u will actually wear it!!!!!! You looks pretty in the red color! 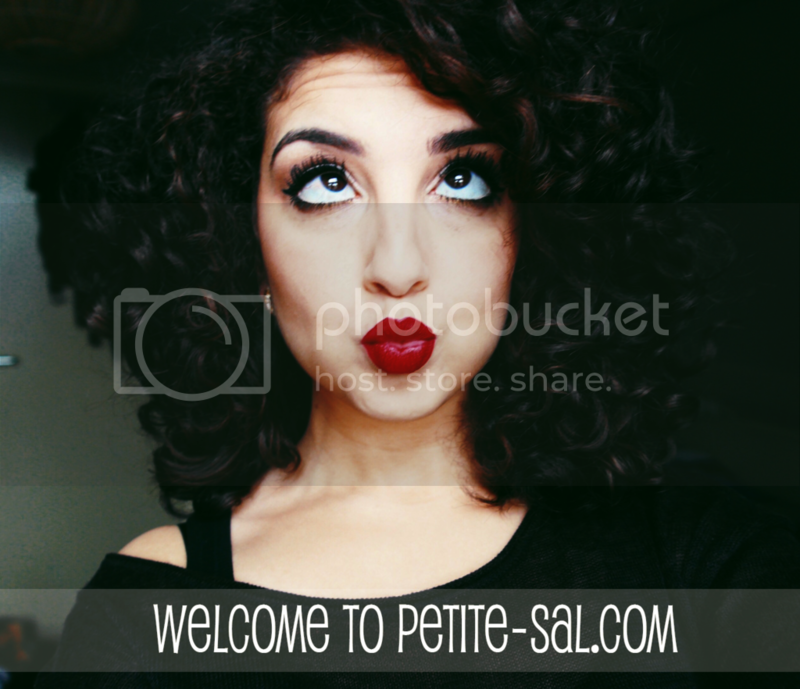 Its very difficult to find our perfect shade of red i think and you've don e a great job!Do check my blog and I'd love it if we follow each other if you like? That is GORGEOUS! It's a totally different shade of red than what I've got or go towards but it's beautiful! Shiseido is hard to come across here but if I ever see a counter I'm going to check that out! Found you via the BBU Blog Hop and followed! :) Looking forward to your posts! Check out my Covergirl Giveaway! Such an interesting post, amazing lipstick!! LOVE that color <3 it looks soo good on you! I love it too! Ah, thank you so much, Jasmine!! That lipstick is so beautiful! It's amazing how red they make your lips look. Thank you for the comment and for joining my blog!!! I'm following your blog on GFC and Bloglovin. love this lipstick!!! Now I gladly follow you via GFC and BLOGLOVIN! I'm on all these sites too!!! Follow me back if you like!!! We can follow each other!!! it would be a pleasure!!! Sal! I've nominated u for the Liebster award! Take a look! Wow! It really works for you it looks absolutely stunning, I just recently bought Macs ruby woo I should've checked this before, I still will though :D and the packaging is gorgeous! This colour looks so sultry and gorgeous on you Sal! I'm really glad you're happy with the customer service you got at the Shiseido counter. Shiseido has some great products - I don't think I have tried any of their lipsticks but I've been trying out their Benefiance skincare line which is quite nice. STUNNING COLOR and soooo perfectly you!!! I think a red lipstick is worth the investment.. This lippie has a pretty color indeed. Too bad for me, it probably wouldn't fit my skin tone. 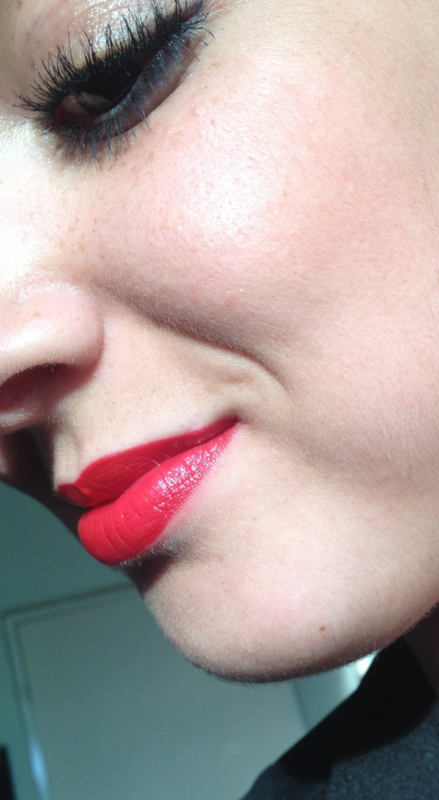 I'm warm-toned and red lipstick with blue undertones doesn't suit me at all..
You cant go wrong with red lippy!! lOVE IT! Thanks so much for recommending me this lipstick, it's beautiful. I would say this is definitely the kind of "Red" I would be looking for!